Samsung just unveiled its latest 2017 flagship, and one of the first things people want to know about is how it compares to its predecessor. Things are unfortunately not as simple in the case of the Galaxy Note 8, as its true predecessor, the Galaxy Note 7, was recalled last year after only a short time on the market. The good thing is that we do have an identical point of reference with the recently released Galaxy Note Fan Edition, which is essentially a Note 7 redux with a smaller battery. To see how much of a jump there has been between generations, here is a quick look at the Samsung Galaxy Note 8 vs Galaxy Note Fan Edition. Starting with the design, both phones feature the now typical Samsung design and build quality, with two glass panels sandwiching a metal frame, and both come with an IP68 rating for dust and water resistance. The only difference here is that the Galaxy Note 8 is a lot more square and angular when compared to the rounded body of the Fan Edition. The in-hand feel is largely similar as well, but the Galaxy Note 8 provides a little more grip because of its sharper body lines. The Galaxy Note 8 comes with a larger 6.3-inch display, while the Fan Edition packs a 5.7-inch screen. Both are Super AMOLED displays with Quad HD resolutions, so you get all the sharpness, vibrancy, and contrast that you could ask for. However, the Galaxy Note 8 comes with a higher pixel density due to its 18.5:9 display aspect ratio. That aspect ratio and super thin bezels of the Galaxy Note 8 help keep it as wide and only slightly taller than the Fan Edition, despite the former featuring a display that is 0.6-inch larger. The Galaxy Note Fan Edition is the last Samsung flagship to feature a front-facing fingerprint sensor, with the thinner bezels of the Galaxy Note 8 requiring a shift of the scanner to the back. Unfortunately, Samsung ignored consumer complaints and kept the scanner in the same awkward place next to the camera, as it was with the Galaxy S8. You do still have other secure unlocking methods like the iris scanner and facial recognition at your disposal though to serve as alternatives. One of the key features of the Galaxy Note series is of course, the S Pen, and not a whole lot has changed with it from the Fan Edition to the Galaxy Note 8. It still has the same clickable top, the same ballpoint tip, and the same feel in the hand. The major change here is on the software side of things. The screen-off memo mode has been improved to make them easier to edit and now supports up to 100 pages of notes. There’s also a new live messaging feature that lets you send custom GIFs that you wrote or drew, and it is a lot of fun to use. Speaking of software, the rest of the experience is also pretty identical as well, with the same UI on top of Android Nougat. Both come with Samsung’s AI assistant Bixby on-board, but the difference is that the Galaxy Note 8 features a dedicated Bixby button which isn’t available with the Fan Edition. The camera is one area where Samsung has a made a pretty drastic change from the Fan Edition to the Galaxy Note 8. The former comes with a standard single 12 MP sensor with a f/1.7 aperture and OIS and has proven to take some fantastic phones and remains a great camera to have in 2017. On the other hand, the Galaxy Note 8 comes with two 12 MP sensors and OIS on both lenses, which allows you to achieve 2x optical zoom and lets you create interesting depth effects that you can alter after the fact. 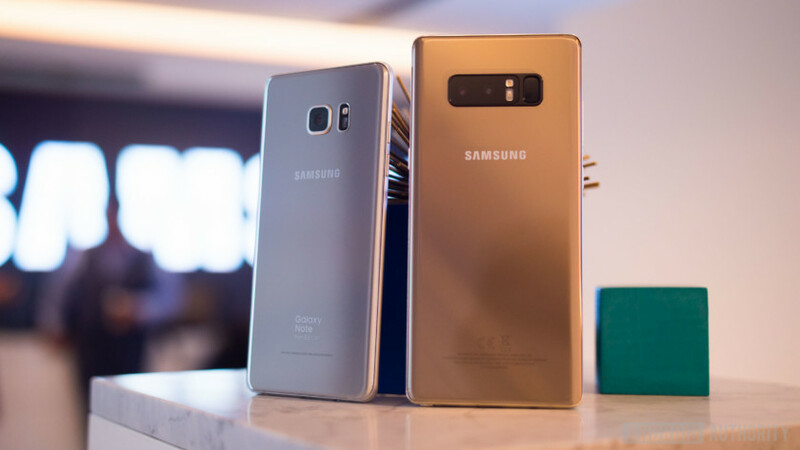 Under the hood, the Galaxy Note 8 comes with the Qualcomm Snapdragon 835 processor, and bumps the RAM up to 6 GB, while the Fan Edition comes with Samsung’s own Exynos 8890 processor and 4 GB of RAM. On the battery front, the Galaxy Note 8 comes with only a slightly larger 3,300 mAh battery compared to the 3,200 mAh unit of the Fan Edition. It is quite clear that Samsung is still playing it safe after what happened last year. While that is never a bad thing, we’re hoping Samsung has some software tricks up its sleeve to get the most out of a relatively small battery that has to power flagship hardware and a massive, high-resolution display. So there you have it for this quick look at the Samsung Galaxy Note 8 vs Galaxy Note Fan Edition! Do you think Samsung has made enough changes with their latest flagship or were you hoping for something more? Do share your thoughts in the comments section below!